Choose from our range of small turntables below (max. load capacity 500 kg). 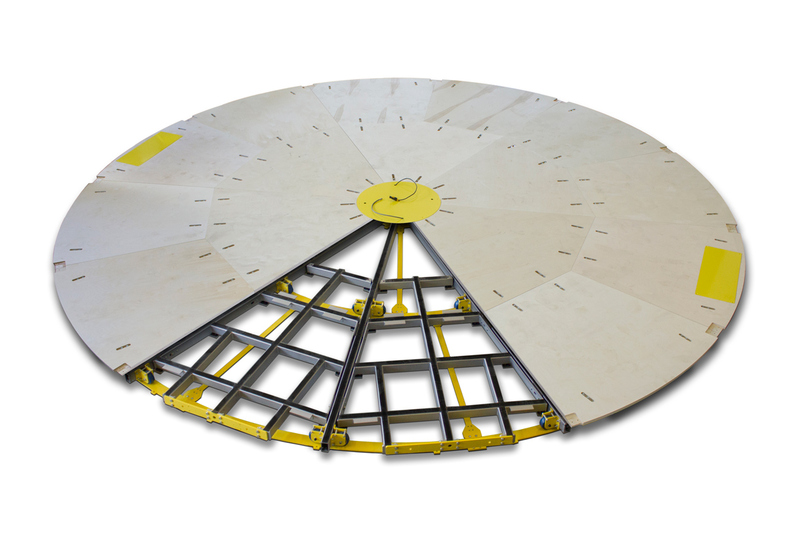 Looking for a larger or sturdier turntable or revolving stage? Check out all turntables. TIP: Base your choice of an electric turntable not only on weight, but also on the height as well as circumference of the product you intend to place on it. Turntable with steel case and great value for money! For displaying gadgets and devices, for instance. Suitable for making 360-degree photos and videos. 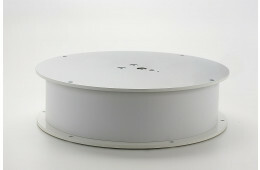 Turntable for suspended presentation of small products such as clothing or displays. You can select from a maximum load of 5 or 20 kg. For products weighing up to 30 kg. Suitable for presentations of shop mannequins, for instance. Presentation surface of max. Ø 50 cm. Optional: revolving power source. To present products weighing up to 50 kg, such as shop window items. Presentation surface of max. Ø 60 cm. 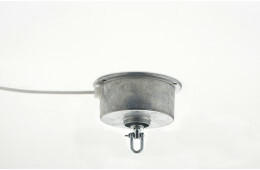 Available with and without revolving power source. Our most sold turntable! Turntable with a maximum load of 100, 200 or 300 kg. Universal use for revolving presentations of e.g. shop mannequins and designer chairs. Presentation surface of max. Ø 80 cm (advice). Available with and without revolving power source. 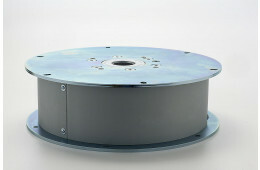 Robust turntable with steel casing and various luxury finishes. To present products up to 500 or 750 kg such as a moped or furniture. Various deluxe finishes available. Presentation surface of max. Ø 125 cm (advice). Add a twist to your product presentation! You’ll find that the attention of your visitors and passers-by will immediately be drawn to the revolving product. Maximum attention for your latest product at a trade show. Standalone turntables, or incorporated into furniture. Also available: off-the-shelf solutions in deluxe finishes you can use at a trade show right away. For revolving mannequins or jewellery display in your shop window, for instance. Choose the right turntable, depending on the size and weight of your product. Pre-Motion also supplies large quantities of turntables at attractive prices. To the major Dutch department store De Bijenkorf, for instance. With each turntable the volume discount/quantum discount is indicated. Turntables for making photos and videos are very popular. You let the product revolve on the electric turntable and take all pictures from the same position. Also perfect for 360-degree videos. Our small, electric turntables have not been developed for photography specifically (no positioning or adjustable speed controls). Still, many photographers use our turntables as a handy tool! Pre-Motion does develop purpose-built large revolving platforms for 360-degree car photography. 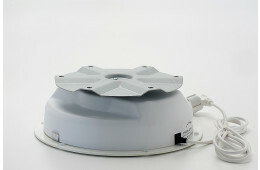 An electric turntable is perfect for scanning a person or product. 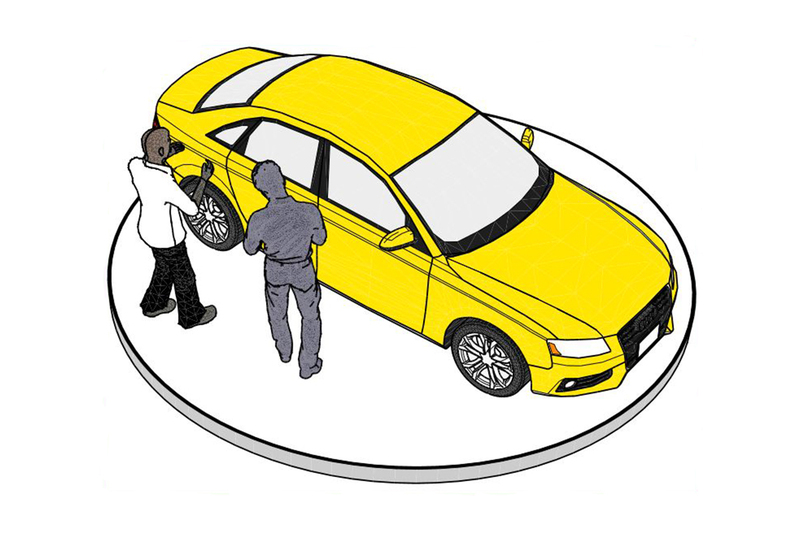 Pre-Motion supplies turntables to companies all over the world that are specialized in product scanning and 3D scans of people. For a revolving display of artworks. Museums often choose a slow-turning carousel. Turntables with 0.8 and 1 revolution per minute in particular provide a calm art presentation. Numerous museums, including The Hague’s Gemeentemuseum, use Pre-Motion’s turntables. Want to put your most important product in the spotlight for your visitors? A revolving platform allows you to give your visitors a 360-degree view of your collection from 1 position. You can start using these finished electric turntables right away. They’re available in various luxurious finishes. Pre-Motion’s electric turntables are off-the-shelf products. This means you can place them in your store or showroom right away. Depending on the type you may screw a presentation disc on top. You can also incorporate the turntable into furniture or a column. Our turntables come with screw holes in the bottom of the turning motor (stationary). This makes it possible to mount the motor on a surface. The top of the motor (revolving) has screw holes as well. Using these you may mount an optional presentation disc of your choice. With most turntables you can choose from various presentation discs. Optional: buying (additional) presentation discs Ø 30 - Ø 80 cm. Most turntables are available with an optional power outlet on the platform. You’ll only need this if the product you want to display requires electricity. If you want to have a lamp revolve, for instance, or a coffee machine that needs power. Without an outlet on the platform, your wires would twist in a knot. Our small electric turntables have a fixed rotation speed. Most cannot have their speed adjusted or be dimmed. This is because their power consumption is already very low. The MAX 100, 200 or 300 kg model is available with optional speed control. When looking for an electric turntable, don’t just consider the maximum carrying capacity. The height and circumference of the product to be displayed to a large extent determine which turntable you need. For with larger and higher products you’ll have to take the leverage effect into account. This means the maximum carrying capacity drops significantly with wider products. Pre-Motion delivers the small turntables from stock. Generally, after payment has been confirmed, they will be shipped the same day. Some additional options and the delivery of large turntables may take a little more time. Please feel free to contact us for details. Electric turntables may also be picked up at Pre-Motion (in Ede, located in the heart of the Netherlands). So you can see the turntable spinning before you buy. Please do call us in advance to make an appointment. You can pay with your debit card and take the turntable with you right away. Ordering and paying in advance is also possible. This will speed up the process. Rather have your purchase delivered? We ship turntables up to Ø 80 cm with DPD parcel service. They will deliver during office hours. Once we have shipped your order, you’ll receive a track & trace code so that you can follow your parcel. How can I place an order with Pre-Motion? You can order a single turntable from us, or several at once. Small turntables can be ordered online directly. For large orders, please contact Pre-Motion; we’ll gladly offer advice and give you a quotation. Order are usually delivered in 3 - 4 business days; Pre-Motion delivers the small turntables from stock. Generally, after payment has been confirmed, they will be shipped the same day. Some additional options and the delivery of large turntables may take a little more time. How do I activate quantity discount on a large order? With each turntable the volume discount/quantum discount is indicated. This discount is applied automatically in your shopping cart. Larger quantities (> 100) available op on request. What delivery methods can I choose from? You may pick up you order at our office (in Ede, the Netherlands) or we'll ship your order to your address. We ship turntables up to Ø 80 cm with DPD parcel service. They will deliver during office hours. Once we have shipped your order, you’ll receive a Track & Trace-code so that you can follow your parcel. Does Pre-Motion ship to countries outside the European Union (EU)? At the moment we only ship to countries within the European Union and to Switzerland. Check out our overview of countries we ship to, stating the delivery costs for each country. Following a consultation, we sometimes also deliver to countries outside the EU (orders on request). Do I have to pay VAT on my purchase? Net prices are listed exclusive of VAT. Dutch taxes (21%) are calculated and displayed at checkout. As a foreign company you will not have to pay VAT to the Dutch authorities. If you enter your VAT number when paying for your order, we will set the VAT at 0% (please fill in your VAT-number without spaces). Delivery costs vary depending of the country of delivery and the size of your order. Check out our overview of countries we ship to, mentioning the delivery costs for each country. Can I view a turntable at Pre-Motion before placing an order? Electric turntables may also be picked up at Pre-Motion (in Ede, the Netherlands), so you can see the turntable spinning before you buy. Please do call us in advance to make an appointment (+31318505751). You can pay with your debit card and take your order with you right away. Can I make changes to my order after placing it? We strive to ship incoming orders as quickly as possible (same-day shipping). After handling and shipping of your order, it is no longer possible to change it. We generally dispatch same day so please contact us as soon as possible if you would like to make any changes to your order. When and how will I receive the invoice? You will first receive an e-mail order confirmation containing all the order details. After receipt of payment, the online shop automatically generates an e-mail invoice. Our e-mails might end up in your spam box initially. So please monitor your spam box as well, or add info@pre-motion.nl to your contacts list as a safe address. Can I add a specific reference to my invoice? Yes; when paying for your order you are able to add, for example, a PO or WO number to your invoice. Can I return my online order? Returns may only be carried out with the agreement of Pre-Motion. You have to inform us of a return request within 8 days of receiving the order. Should we give our permission for the return of goods (which are not subject to a returns’ claim) the customer will be liable for the post and packaging costs of the return. Pre-Motion will reimburse all purchase costs minus any transport or associated costs of returning the items, either through payment or by issuing a credit note. In the case of damages or wear and tear, the amount to be reimbursed will be reduced accordingly. Return claims: you must inform Pre-Motion of any product defects in writing and within 8 days of receipt, and return any such goods at Pre-Motion’s expense. If the packaging has become visibly damaged during transport - meaning the product is also damaged - you must notify Pre-Motion of this within 3 working days of delivery. What kind of warranty do I have on electric turntables ordered from the web shop? You must inform Pre-Motion of any product defects in writing and within 8 days of receipt, and return any such goods at Pre-Motion’s expense. Since proper functioning of the turntable strongly depends on the manner in which weight is distributed on the turning construction, we are not able to offer long-term warranty. Are you experiencing problems with your turntable? Then please get in touch with us; we'll have a look at your situation to see what we can do for you. Why is my tracking code not working? It might take up to 12 hours before information about the shipment is being shown via the Track & Trace-code. Can I remove the revolving power source of an electric turntable myself? 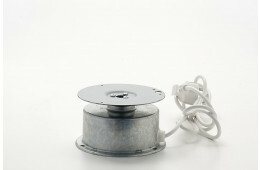 If you want to convert the turntable into a turntable without power outlet, you should contact us. For a small fee, we can open open up the turntable, remove the revolving power source for you and then send the converted turntable back to you. Please note: the turntable is not covered under warranty after you have opened up the turntable yourself. Does Pre-Motion supply screws when buying a presentation disc? Yes; the presentation disc comes with a small plastic bag with 6 screws + 6 rings. How can I mount a presentation disc on a turntable? We provide a step-by-step guide for mounting a presentation disc on your turntable. Our web shop offers presentation discs of Ø 30 - 80 cm. Please note that these presentation discs are too large for the two smallest turntables in our web shop: the MAX 4 kg turntable and the MAX 5 kg turntable. You are, however, able to mount your own presentation disc to one of those small turntables (< Ø 30 cm). Can I make turntables rotate faster with speed control? No; you are only able to lower the speed of rotation of our MAX 100 - 200 - 300 kg turntable continuously up to -40%. Can I adjust the direction of an electric turntable? Electric turntables only turn in one direction (usually clockwise). You can check out the direction of a specific turntable by looking for the tab with Specifications under each product. Exception: for the MAX 500 - 750 kg turntable you are, however, able to make the turntable rotate in both directions by selecting the option for clockwise and counter clockwise rotation. Can I adjust the speed of an electric turntable myself? No; electric turntables only have one rotation speed, varying from 1 to 2.5 rotation(s) per minute. You can check out the rotation speed of a specific turntable by looking for the tab with Specifications under each product. However, for the MAX 100 - 200 - 300 kg turntable, you are able to lower the speed of rotation continuously up to -40% by purchasing speed control with your turntable. Can I place my product directly on the platform? It depends on the type of turntable you choose. 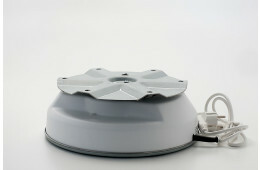 Our webshop turntables are sold without top plate. This allows you to screw on the presentation platform of your choice yourself. This is very easy to do. If so desired, you can also order a presentation disc with your turntable; Pre-Motion offers them in various diameters and materials. Revolving platforms with a diameter of 150 cm and up are sold with a sturdy top surface of laminated wood, which you may finish in any manner you choose. I need power on the platform. Is that possible? Want to spin an electric device on the turntable? Or you want lighting on the platform? You’ll need a turning power connection. In such cases, select the extra option ‘sliding contact’. A 230 V power connection (connector block) will turn along with the platform. What’s important when choosing the right turntable? Which turntable you need, depends not only on the weight; weight distribution is equally important. The maximum weight capacity mentioned with each turntable is based on products placed in the centre of the platform. Want to distribute the weight on a turntable eccentrically? Then we recommend a heavier turntable; our medium turntables and large revolving platforms can be loaded eccentrically. The diameter of the top plate is also an important factor. With a large diameter there will be a leverage effect. This means you will need a larger revolving platform when you’re using a larger presentation disc. What exactly does the leverage effect entail? A good example to illustrate the effect is lifting a bucket full of water. You’ll probably find it easy to lift a bucket of ten kilos. But when you’re asked to hold the same bucket with your arm extended -with the bucket at about half a metre from your body- it suddenly becomes almost impossible to hold the bucket in the air. This leverage principle plays an important role with turntables, when carrying a load that’s not in the middle or is not evenly distributed.